Precision components provide safe and leak free fluid dispensing from syringe barrels. End caps are used to seal the top of the barrel for safe storage of liquids inside. The caps are quick to attach and easy to remove as they snap-lock over the barrel end flange. A snap-on type end cap to seal the flange top of 3cc size syringe barrels. Quick attachment and removal. The cap snaps into place with clips that hold the barrel top. 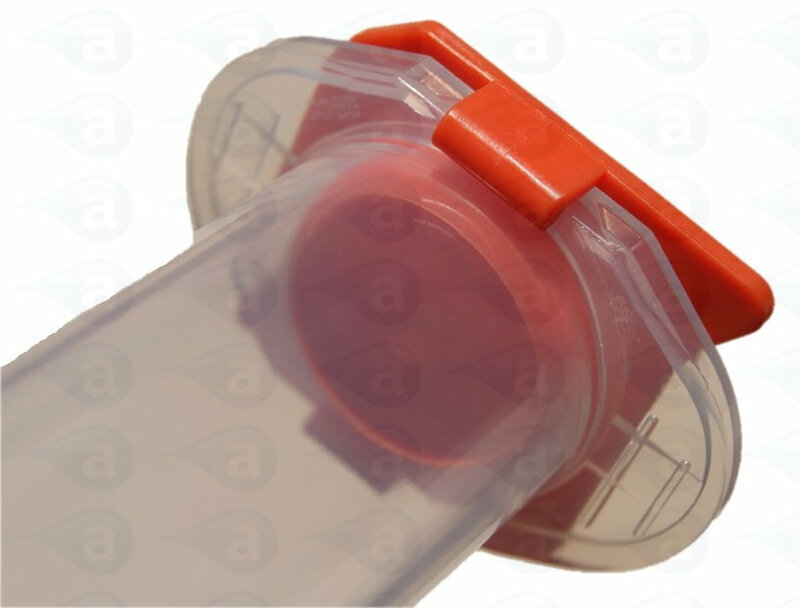 End caps are ideal for air-tight storing of filled syringe barrels. Low level inner plug does not excessively obtrude into syringe barrel. Compatible with all 700 series 3cc size syringe barrels. Supplied in quantities of 50 or bulk packs of 1000. Silicone free components. Moulded from polyethylene. Available from stock. A wider range of syringe barrel end caps are available. All plastic components are silicone-free to prevent any contamination of sensitive adhesives placed near to them. Caps are available for a wide range of syringe barrel sizes. End caps seal the top of the syringe barrel and tip caps seal the outlet end. All products are industrial grade safe and silicone free. Supplied in sealed boxes or packs with labels and batch codes.